Blocky Crimson sweet hybrid watermelon. Excellent vine growth, ensuring excellent cover for the heavy set. 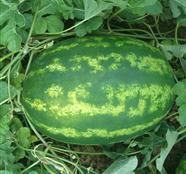 Blocky, oval shape and crimson sweet rind pattern watermelon, averaging 11 - 13 Kg in weight. Bright red crispy flesh with high brix. Harley F1 performs well in arid and semi-arid areas, due to its tolerance to drought conditions.